Principal Dr Abdul Karim, Chairman of Parents Care School and College addressing the annual literacy and cultural programme of the school as Chief Guest recently. The annual literacy and cultural competitions of the esteemed educational institution in the port city - Parents Care School and college was held recently with its Principal Jaharlal Bhattachariya in the chair. Chairman of the PCSC managing committee, noted physician , social personality and Chief Editor of Monthly Homoeo Chetona journal Principal Dr Abdul Karim graced the program as chief guest. Chattogram district President of BHMA Advocate Dr. Samiuddin was the principal speaker in it. Admin officer of the school MA Fazal was present on the occasion as special guest. 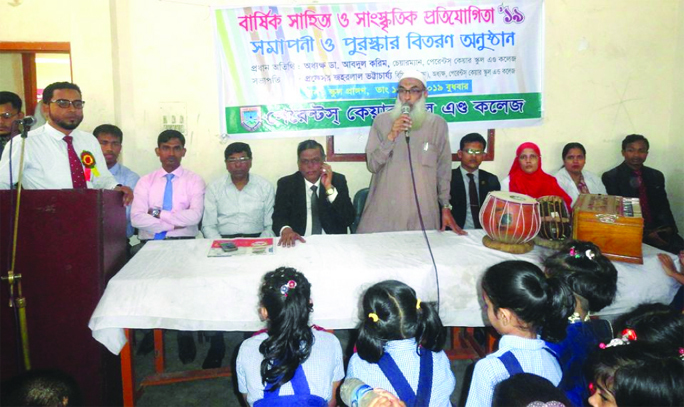 Teacher Mizanur Rahman and Jalaluddin Kawser conducted the programs as moderators. About two hundred students from play group to class Ten participated the competitions in Kerat, Hamd, Nath, Gita recitation, Rabindra song, Nazrul Sangeet, patriotic and folk songs and common dance sequence. In brief deliverations of the chief guest directed the students for disciplined academic studies and emphasized over timely study. He also expressed satisfaction over the present Principal's right management and gradual development of the school. The principal speaker assures all sorts of cooperation to sustain the present prevailing environment and development of the school. The viewers hailed the participants for presenting the praiseworthy cultural events. 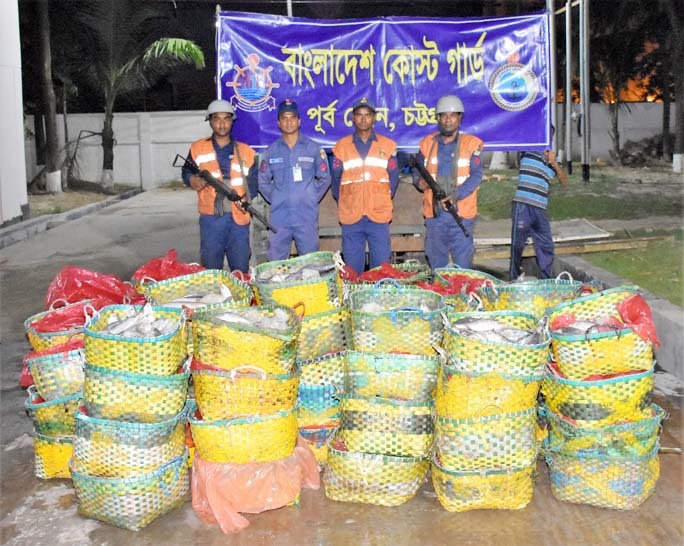 Members of Coast Guard recovered 11, 500 kgs of jatka from Toll Plaza of Karnophuli River on Wednesday. 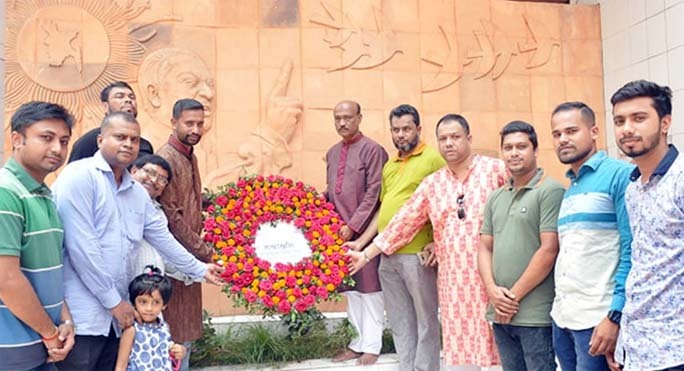 Leaders of Tanti League, Chattogram City Unit placing wreath at the mural of Bangabandhu at Chatogarm Press Club marking the Mujibnagar Day on Wednesday. 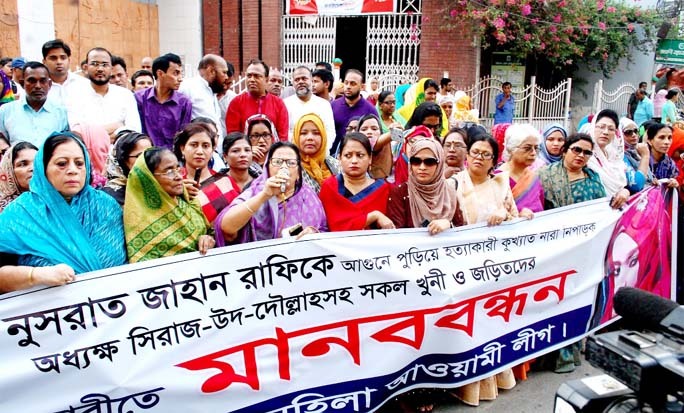 Hasina Mohiuddin, President, Chattogram City Mahila Awami League speaking at a human chain on Wednesday demanding execution of killers of Nusraf Jahan Rafi, a madrasa student of Sonagazi. The month-long Small and Cottage Industries and Business Fair was inaugurated in Halisahar on Monday. 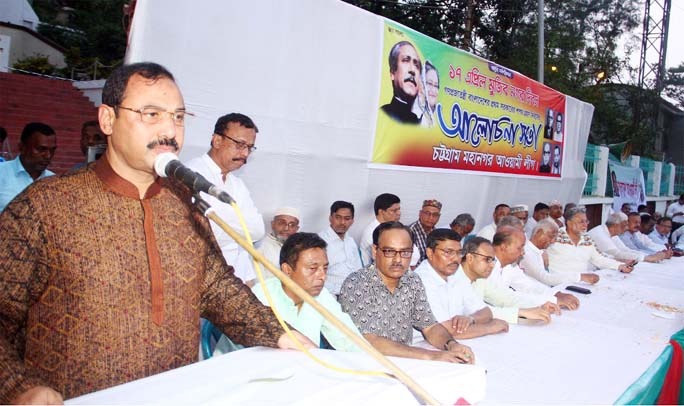 CCC Mayor A J M Nasir Uddin speaking at a discussion meeting on the occasion of the Mujibnagar Day organised by Chattogram City Awami Leagues as Chief Guest on Wednesday.